One of the latest underground hopefuls is Recon By Fire, who formed in Warsaw in 2014, and released a two-track digital demo a year later. Recon by fire, sometimes referred to as speculative fire, is a warfare tactic in which military forces fire on possible enemy positions to prompt a reaction, thus confirming the presence and position of enemy forces. 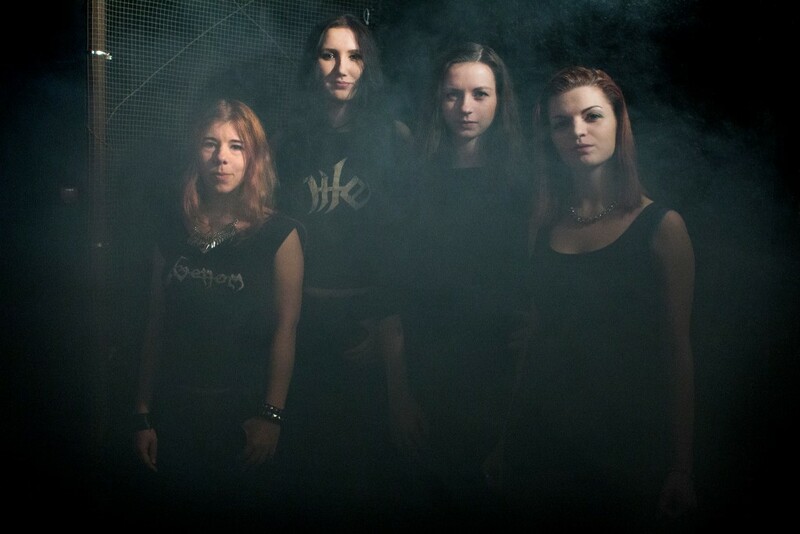 The girls play a contemporary thrash/groove metal variant that is influenced by the archetypical European and American institutions of the genre – while also drawing from other non-metallic sources such as classic rock. “Into the Fire” is short demonstration of what direction the girls intend to aim at. 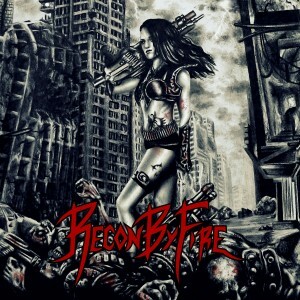 The biggest asset of Recon By Fire as a band is its more varied riff set and better lead – and bass guitar playing in comparison to its most visibile South American competitor Nervosa. Magda Piędzia’s tight rhythm playing and Alexandra Musielewicz’ explosive soloing are what elevate Recon By Fire from the average retro thrash metal act. Anna Lewandowska isn’t on the same technical level as the late Roger Patterson (Atheist), Cliff Burton (Metallica) or Steve DiGiorgio (Autopsy, Death, Testament, et al) as of yet but her funky, burly licks and adamant refusal to simply double the guitar riffs is one of her strongest traits, and should be further deepened out in future material. Lena Dubravska’s drumming is fairly basic and only serves to keep the time. In due course she’ll hopefully embrace a more varied playing style with different techniques and more interesting fills and rolls. Anna Lewandowska’s thick and thunderous bass guitar is integral to the sound of the two tracks. This is especially true for opening cut ‘Traitors’ wherein it gets very prominent towards its conclusion. The highlight of the track is the extended solo by Alexandra Musielewicz, who seems to draw inspiration from early Metallica, and “Show No Mercy” Slayer for the most part. ‘Sudden Death’ opens with a funky bass guitar lick and Mila Sobol opts for a death grunt and thrash bark as main vocal cadence. Sobol’s harsher vocals are better than her cleans, but they fit the style. She hasn’t too thick of an accent or inflection. As before Musielewicz’ solo is one of the best parts of the song. There isn’t a lot of character to the drumming as Dubravska merely lays down the beat. The inclusion of a faster tempo would probably allow her show what she’s truly capable of in regards to single – and double foot blasts. A careful study of the collected works from Krzysztof ‘Doc’ Raczkowski (Vader), Marcin Gołębiewski (Yattering) and Adam Sierżęga (Armagedon, ex-Lost Soul) would certainly help in improving her playing. It would be interesting to hear Recon By Fire attempt an epic instrumental in vein of ‘Inquisition Symphony’ (Sepultura), ‘Call Of Ktulu’ and ‘(Anesthesia) Pulling Teeth’ (Metallica) especially in the light of how audible Lewandowska, Dubravska and Musielewicz are in these two tracks. Through out said cuts the trio comes off as the most confident of the quintet’s membership. Much like its populist Brazilian contemporaries Nervosa, Recon By Fire right now is having too much of a good time to be bothered with writing actual engrossing songs. The quintet’s true power will be revealed once they settle on what direction they want to take their music. “Into the Fire” has something of a party thrash and alternative rock vibe in various instances, but when and if these girls decide to write darker, faster and generally heavier material they might just surprise the world with its musicality and proclivity towards memorable hooks and arrangements. The handdrawn artwork by Karina Wilczek is befitting of the band’s war-themed lyrics and the canvas is either a positive female empowerment vista, or a clear-cut case of a female warrior in highly impractical battle armor. The artwork is problematic in the sense that its cover figurine stands in stark contrast to the band’s non-sexualized imagery. Whether it suffers from the male gaze is up for debate but it gets the intended message (self-empowerment, overcoming adversity and tribulation) across at the very least. A canvas by Raúl González, Jean Pascal Fournier, or Jowita Kamińska could potentially make its future product more marketable. It certainly is much better than what other, and lesser bands adorn their demos with. Obviously Recon By Fire understands the importance of visuals as both the cover drawing and promotional photos that come with it possess a level of maturity often lost on these kind of bands. “Into the Fire” was recorded at HZ Studio in Warsaw, Poland with Mariusz Konik and Robert Wawro producing. For a band with no mentionworthy prior experience within its ranks “Into the Fire” sounds incredibly smooth, crunchy and bass-heavy but never overproduced. There’s a sense of airiness and openness that modern productions usually miss. The rhythm section is the primary focus of the production job while the guitars have the sort of grit and bite one has come to expect of the better known Hertz facility. From the production to its promo shots and its general social media presence Recon By Fire is one of the more accomplished bands in the underground. Whether or not this will eventually translate in a record deal and business/touring opportunities is an entirely different discussion altogether. It wouldn’t be for the lack of trying at least. The biggest strike against the demo is that Recon By Fire is undecided and uncommitted to exactly which direction they intend to take their music. As such the demo sounds exactly as you’d expect of five people coming from different genres to write music together in a mutually agreed upon direction. Neither of the two tracks sound particularly threatening or harnesses the velocity of prime era Sepultura, nor the technicality and controlled chaos of a Death, Atheist or a Dead Head. There’s a sense of musicality and looming potential just below the surface that might hint at greater things in the future. However, beneath the vanilla song formatting and productional gloss lies the sort of dormant musicality that holds a promise for greater things to come. Whether or not Recon By Fire will be able to tap into that musicality and potential is another discussion entirely, but it is definitely present in the two tracks of this digital demo.